Businesses all over the world are rapidly going through solar energy transition. And this exceptional rate of solar adoption clarifies that positive PR and wanting to reduce carbon footprint are not the only reasons fuelling this growth, it is much more complicated. Incorporating a ternary bottom line strategy when any industry decides to install ground-mounted solar panels, which is expected to offer greater business value through better performance in social, environmental and financial frameworks, in a nutshell, it is about maximizing returns by providing better solutions for not only to people but also the planet earth. For most of us, the concept of installing ground-mounted seems to be a concern, while having some roof space to utilize. However, getting a ground-mounted solar system installed is much simpler than what we often think. Year after year, known international companies like Amazon, Walmart, Google, Facebook and more are ramping up their solar capacities. Taking a look at the Indian companies, backed by Government’s continuous efforts at solarizing the country, they have also shown an affinity towards solar energy adoption. So, if a company is willing to go solar, then what are the deciding factors? In today’s era, carbon emissions stand as a necessity for commercial entities and solar energy is one such renewable energy that helps in diminishing it, ensuring access to power and saving on electricity bills. 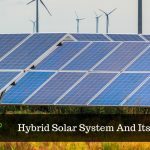 Further, to avail and aid in restoring the climate this renewable energy – solar power system stands as the best option for commercial entities, as 1 kW of green energy can reduce more than 3,000 pounds of CO2 annually. Therefore, looking at the numbers add up, this power system and business go hand in hand. However, given a fact, in the last five years, the cost of buying and installing solar has significantly decreased, and the economics of opting solar power system has become more attractive. 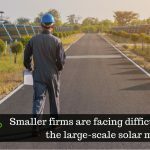 For a mid-sized to large size business organization, energy requirements are quite higher, moreover the power to flourish small businesses need constant access. The conventional energy distribution is going to get inconsistent as the fossil fuel reserves further deplete, and population growth rises. Developing countries like India are already suffering from energy deficit and transmission issues. 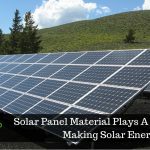 In such a scenario, adopting a ground-mounted solar panel system seems to be a smart move, as it can offer un-interrupted energy supply with ease. And with the demand growing, it is suspected that corporate solar power market in India could amount to 10,000 megawatts (MW) by 2023. Every year carving out huge chunks of money from business profits, conventional energy expenses are suspected to rise considerably. The best way to save on energy expenses is to generate the power yourself. In such a scenario, solar stands a viable option to produce energy, thus saving money in the long run while satisfying energy requirements. 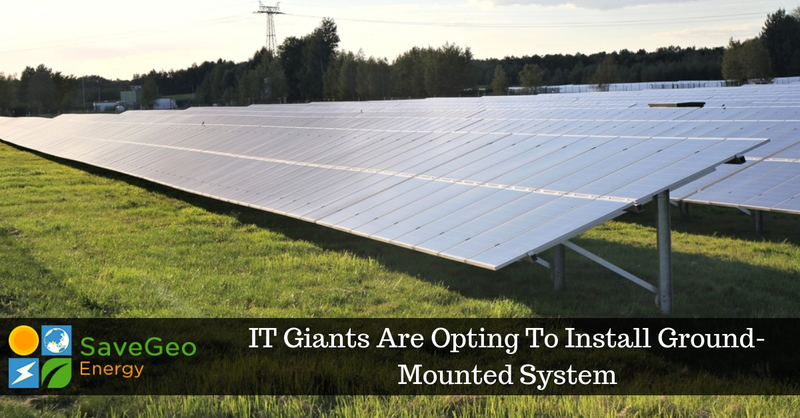 Hence, location plays a vital role in the use of mounting systems to install solar panels. Rooftops are the ideal choice since they are mounted using metal frames and bolts, and do not require additional structure to support the panels. A building’s roof in some cases, however, may not be appropriate for solar installation due to some reason or the other; insufficient space, the complexity of the roof, shading, etc. In such cases, a ground-mounted solar system is the best choice that can turn unused land space into a revenue-generating asset. SaveGeo provides ground-mounted solar solutions designed and engineered based on the client’s site-specific conditions. With diligent project planning and accurate execution, our solutions are tailored based on the uniqueness of your requirement. We provide a wide range of ground-mounted solar solutions offering freedom and flexibility to support PV modules of various types.